My long time friend Patricia passed away in October. 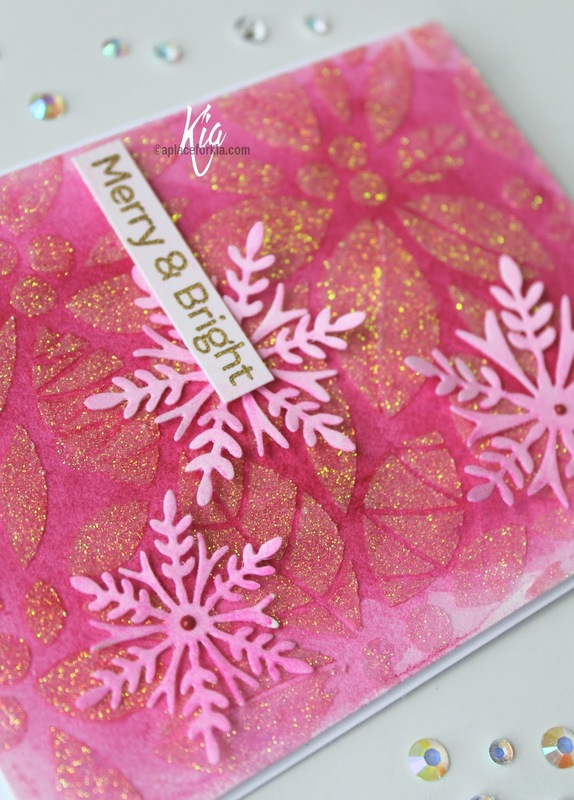 Her favourite Christmas cards from me were always the pink ones, and she loved it when I used sparkle and Poinsettia flowers and snowflakes. So, using all her favourites, this one is for Patricia. Using Daniel Smith Quinacridone Pink I did a wash, in layers building the colour for my background. 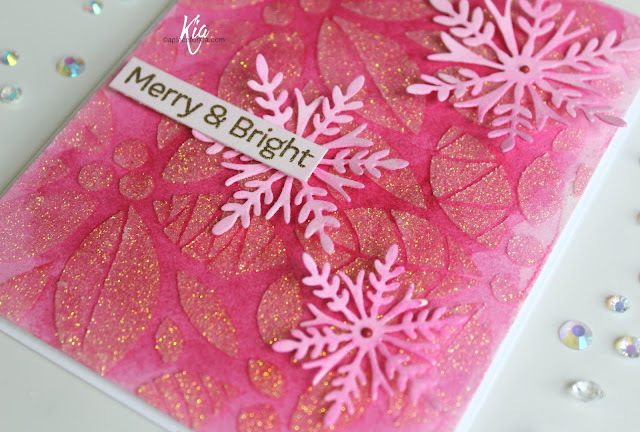 Once dry, I stencilled using my Honey Bee Poinsettia stencil and Nuvo Glimmer Paste in Moonstone. Wow, do I love this look. I then cut my panel to size, and attached the watercoloured piece to a piece of fun foam, then attached it to my card base. I die cut the snowflakes and watercoloured with Daniel Smith Opera Pink, and I also did a light light wash of Opera Pink to use for my sentiment while I had my paint out. Once the paste was dry I attached the snowflakes. I stamped the sentiment using my Mini MISTI, and Versamark Ink, then heat embossed using Gold Embossing Powder, then trimming to size and attaching with foam squares. And finally, I used a bit of Nuvo Vintage Drops in Red on the snowflake centres. I am very happy with how this card turned out, and I know Patricia is smiling. What a wonderful way to remember a dear friend! This card just glows, it’s so beautiful . I loved your story. Your photos clearly illustrate your project. No doubt your friend knows that you were inspired by her. Hugs. This is absolutely stunning!! 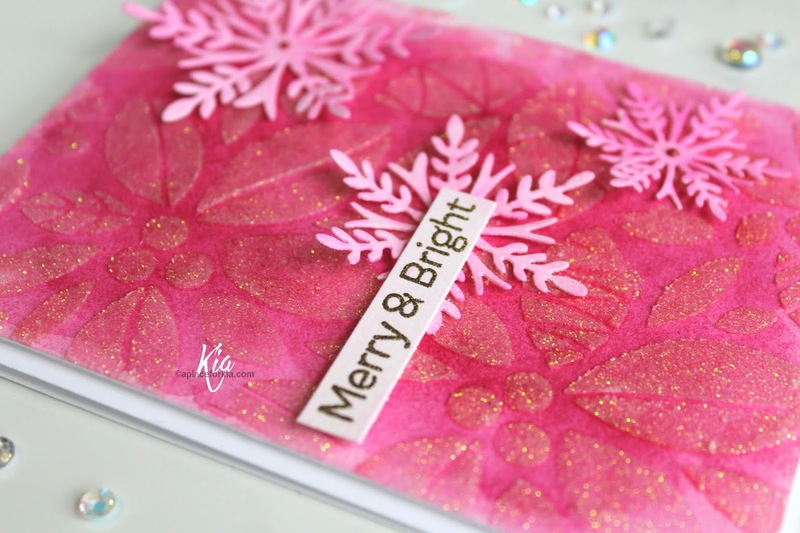 I LOVE that dark pink and the way you used that stencil is fabulous. What a nice tribute to your friend. 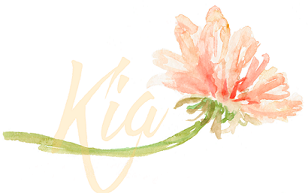 I'm sorry to hear that you lost a long-time friend, Kia. I'm sure she's pleased to see this wonderful card. I love the color of the background wash and the glimmer paste stenciled leaves look amazing over the wash!! I love this card!